Nammos is something of a Mykonos institution. When planning a trip to the island and soliciting suggestions as to where you should visit – no matter whether you are asking for a good beach, the best party atmosphere, the coolest venue, a great meal or just an ‘experience’ – the answer will almost invariably be the same: Nammos. 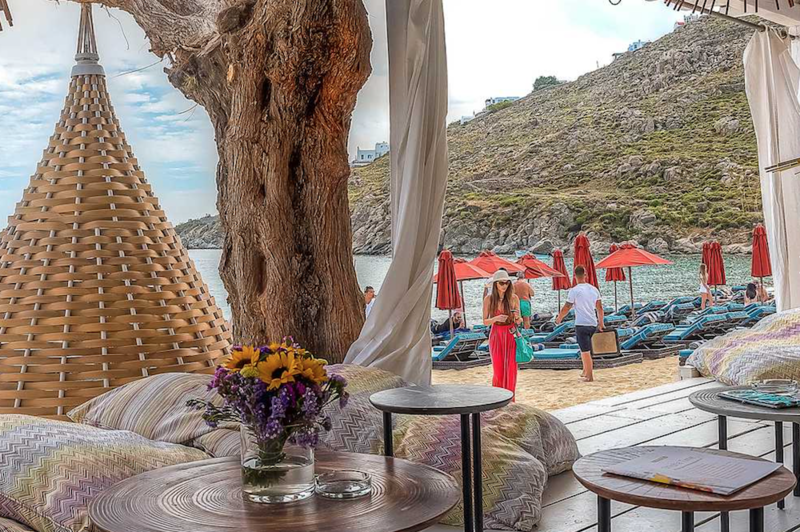 Given that the super-yachts line up in the harbour of the main town that boasts a raft of exclusive restaurants and night-spots, it is something of an achievement for an erstwhile simple beach-side taverna to steal the show. Located at Psarou, a couple of miles from the stunningly picturesque main town of Chora, Nammos has cultivated its exclusive image over the years to become the spot for wealthy Athenians and well-heeled tourists, and in a little over a dozen years since its 2003 opening, it has become one of the most famous establishments in Europe. The fine, sandy beach at Psarou is almost totally covered with impossibly extravagant sun loungers; the best have dark polished wood with shiny brass fittings. The rich and beautiful lounge here on the deep cushions sipping cocktails whilst the efficient waiting staff are always at hand to serve up the next pink champagne. This is the place to see and be seen. Think Valentino, Elizabeth Hurley, Michael Douglas, Lindsay Lohan, Jose Mourinho, Tom Hanks et al – usually dropping in by boat via the private jetty. If you get bored with the lounging or people watching, you can pop back to the beach boutique and snap up a vintage Gucci bag or adjust your hair extensions at the salon. If you’re lucky, there may even be a fashion show, a concert or special event, not to mention of course the excellent food upon which Nammos has built its name. It is principally this fine dining that attracts us here, so given Nammos’ well-established reputation, we cautiously schedule our visit mid-evening to avoid the notoriously raucous late afternoon parties. We arrived at 8pm – with half an hour of high-decibel partying still to go – but it was not long before the sound levels eased and the ambience switched to a more relaxed evening mode. We love a good party but post dining not during! We were directed to the open air restaurant situated along the back of the attractive beach where we were able to select between the rustic tables scattered under the palms, sand underfoot, or the sleek polished ones, sheltered under an atmospherically lit canopy. We picked the palms and were soon served with chilled pink champagne and home-made rosemary bread with the most exquisite, tasty dips. 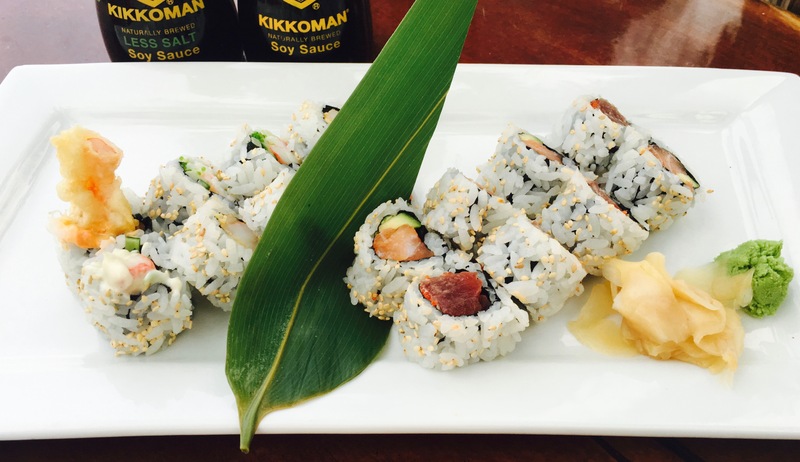 Back in 2006 the Nammos Group opened the Coo sushi restaurant in Chora and although it since closed, they have always kept the tradition alive with some famously good Japanese specialities. 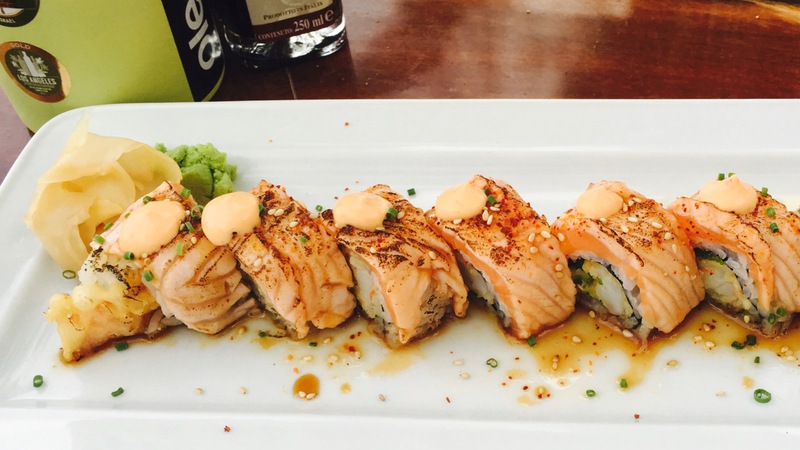 We therefore picked a selection of fresh sushi rolls alongside a plate of one of their salmon sushi – absolutely delicious. A plate of fish tagliatelle was similarly tasty before we enjoyed a sea-fresh red snapper, carefully filleted before us, accompanied by a selection of perfectly cooked vegetables accompanied by an enjoyably crisp and dry Greek white wine. To finish we just about managed to squeeze in an exquisite dome-shaped desert of chocolate-covered coconut cream. After carefully avoiding eye contact with the bill – for this is a venue where oligarchs have been known to happily splash out a cool 140,000 Euros for a Midas bottle of Champagne – we slipped our way out in to the cicada-chirruping of the Greek olive groves and made our way back to the lovely (and very peaceful) Greco Philia Hotel (see our review here). There are some that may find the atmosphere too lively or the music too loud; there are also times of course when a Greek salad at a sleepy taverna could have more appeal, but there is no denying that this is an attractive venue, with excellent service and wonderful food. Definitely a place to experience. Our recommendation for Mykonos? Go to Nammos! CELLOPHANELAND* were guests of Nammos.